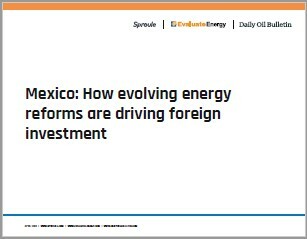 Evaluate Energy, the Daily Oil Bulletin and Sproule have partnered to provide a detailed overview of the key M&A and licensing trends in Mexico in recent years, following major energy reforms announced in 2013. To download your free copy, please complete the form on the right of this page. The main amendments made to Mexico's constitution, regulatory systems and administrative agencies to support the reforms. The winners and key trends seen in each bidding round held so far. The role Pemex has played to date and its ongoing plans. The recent successes and challenges faced by neighbouring nations that are also competing for outside upstream investment. The report also includes details on the key players from the group of almost 70 oil and gas companies now invested in the Mexican upstream sector. Please complete this form to register and receive a copy of this report.